But this "share the crumbs" economy is just the tip of a looming iceberg that the middle class is drifting toward. 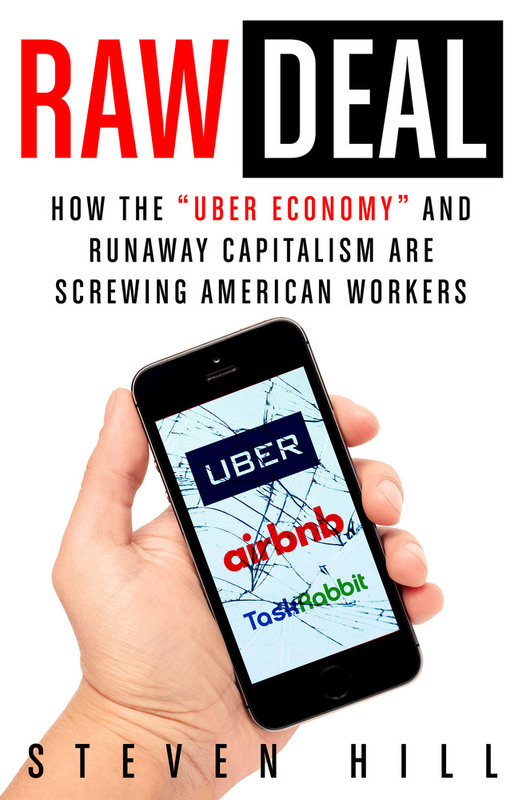 Raw Deal: How the "Uber Economy" and Runaway Capitalism Are Screwing American Workers,by veteran journalist Steven Hill, is an exposé that challenges conventional thinking, and the hype celebrating this new economy, by showing why the vision of the "techno sapien" leaders and their Ayn Rand libertarianism is a dead end. STEVEN HILL is a Senior Fellow with the New America Foundation and a Holtzbrinck Fellow at the American Academy in Berlin. He is a veteran journalist and author of several books, including the internationally praised Europe's Promise: Why the European Way is the Best Hope in an Insecure Age, which was selected as one of the "Top Fifteen Books of 2010" by The Globalist. His articles and media interviews have appeared in the New York Times, Washington Post, Wall Street Journal, The Atlantic, Financial Times, The Guardian, Le Monde, Die Zeit, Project Syndicate, Los Angeles Times, The Nation, Politico, Mother Jones, Huffington Post, Salon, Slate, BBC, C-SPAN, Fox News, NPR, PBS, Democracy Now, Austrian Public Broadcasting and many others. He lives in San Francisco, CA.